Fiber Flux: Crochet Loom Blooms...Book Review & Giveaway! 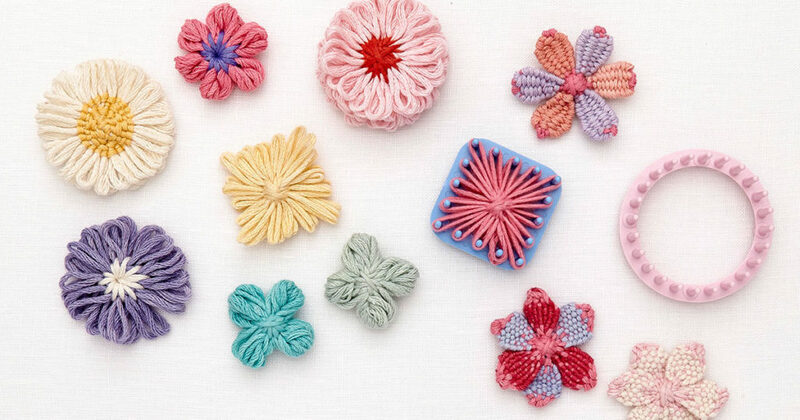 Crochet Loom Blooms...Book Review & Giveaway! I have a perfectly springy book review & giveaway for you today lovelies! I was recently able to check out Crochet Loom Blooms by Haafner Linssen (ISBN: 978-1-63250-619-1, Interweave F+W). I absolutely love combining different kinds of craft techniques, and this book does not disappoint! 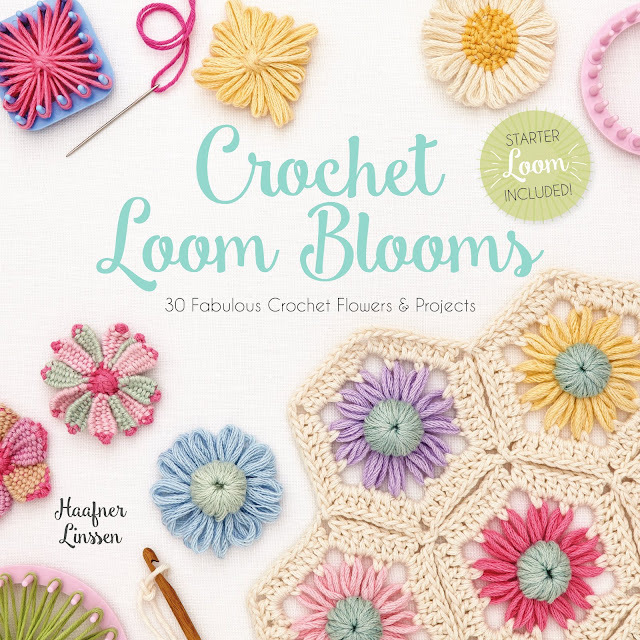 Crochet Loom Blooms joins flower looming and crochet into one beautiful book! This book is full of gorgeous blooms, motifs, and projects to give your space a little springtime beauty! Even beginners will be able to work up the projects thanks to full color photographs, detailed charts, and well written instructions too. Don't have a loom? No worries, there's one included at the back of the book! I love the design above...I can totally picture this sitting on an elegant table! Once you've crafted your blooms (30 unique blooms in the book), you'll learn how to join them and add gorgeous edging and other pretty details. After you've mastered the technique, flip towards the back for five fabulous projects for the home. Now is you chance to win a copy of your own! Enter to win using the Rafflecopter below (sometimes it takes a moment to load). Giveaway ends April 17th and is open worldwide. Now go, go, go, and enter!!! Special thanks to Interweave F+W for sponsoring this giveaway. I received a review copy of this book, all opinions are my own. This book looks amazing! Love all the flowers! Would be perfect additions to any projects I make for my girls. Thanks for the giveaway! would love to give this a try!!! thanks for the chance to win! I like the flowers that look woven. Wow! Love these pretty little flowers. Adding different borders to create different shapes creates endless ideas for projects. Wow what an awesome book! Love the flower motifs. Love the loom idea too! Great giveaway and a book I would love to have! Design possibilities are endless! I love learning new patterns and new ways to put them together. I really like the daisy flower found on the cover. 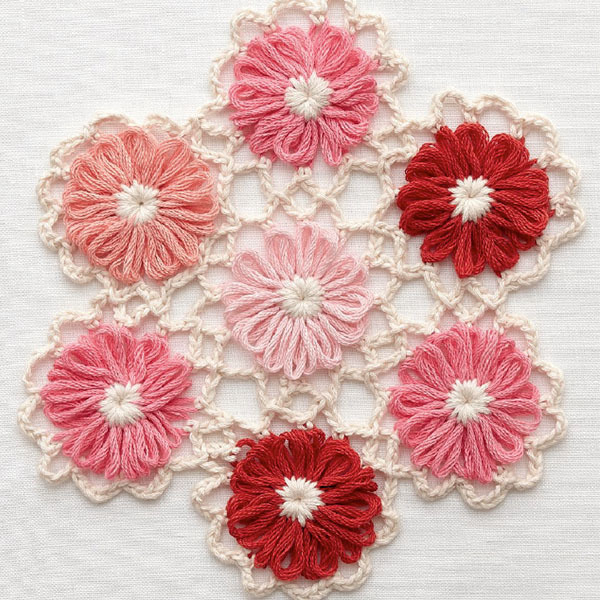 I want to try the six sided motif with the crochet border. This would make a beautiful doily in a few places in my house. Thanks so much for this giveaway. Wow! How could I choose just one! There are several on the front of the book that catch my eye but I don't know their names! Thanks for the opportunity to win a copy of the book!! !